Incorrect. They have lost 6B+ in a dozen years. You don't read financial reports apparently. Is 12+yrs long term to you? No end in sight for another year+ to these losses and even then only if cpu/gpu are both a big hit. I'd say long term survival depends on selling short term, as in PUT THE COMPANY UP FOR SALE TODAY. The purchase price of ATI was the worst thing, but they've compounded it by not concentrating on CORE products (consoles stole from cpu/gpu/server), and making it worse by laying off 30% of the people that MAKE the core products that might one day make a profit. They need to sell so they can re-arm with engineers via somebody that has the cash to get the job done. One more point on poor management; management needs to be fired for not understanding a few simple rules of business. Charge a price for your product you can make a profit at, and quit slashing attempting to price enemies to death that you financially can't price to death (NV price war is stupid, Jen has said so, AMD refuses to get the obvious). Intel can afford to price an AMD to death, but AMD can't afford to price an Nvidia to death. You only end up pricing yourself to death doing this crap. If AMD puts out 300's and prices below NV they are idiots. Nv will respond with higher prices as Jen has said openly he'd rather be making more money then being in a price war (well he should say that, he has ~2/3 of his money invested in himself and his company). 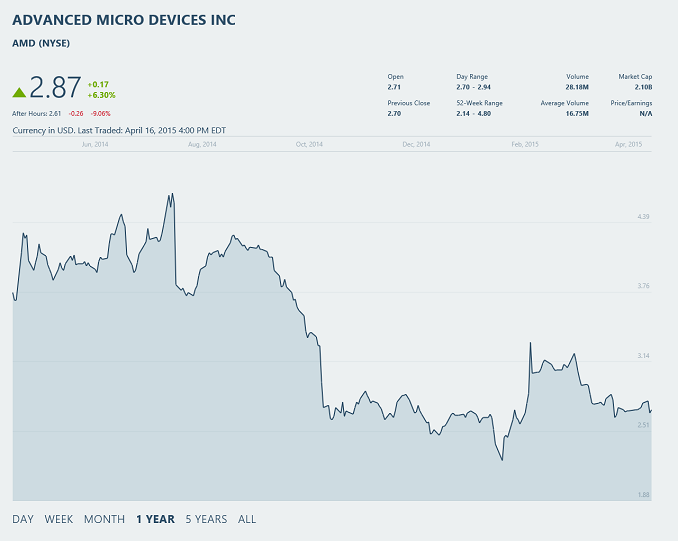 Why does AMD keep pricing their products into losses? Intel is a bit different here, as they are actively seeking a price war at times, where NV doesn't want one at all (they'd rather be making 2007 income, which they haven't hit SINCE 2007...LOL). If you take out Intel's 266mil/yr paid to NV, they're making ~1/4 of what they made in 2007. Nvidia would love to make Intel's 266mil+800mil from 2007 vs. 266mil+200mil today, but AMD management insists on acting like idiots hurting both sides. I love low prices, don't get me wrong, but don't want either side not being able to do R&D because of it. AMD needs to release a CPU sans gpu again with massive IPC on a closer process to Intel so they can beat them while they're totally concentrating on gpu and ignoring cpu (intel ignores enthusiasts these days for a stupid gpu we turn off). Dedicate all the wasted gpu space (on apus which will never make a dime vs. Intel coming down the chain and ARM coming up) on a pure cpu die. That is a chip you could charge a premium for until Intel could fix the problem. Intel is giving away 4.1B of chips to stop ARM, so no chance AMD will get rich off of mobile any time soon and notebooks won't do any better either no matter what AMD does in apu. They've been better than Intel in gpu side on these for ages and it makes them nothing. A cpu for enthusiasts (who Intel has been ignoring for ages since AMD gave up) would get a premium as enthusiasts pay premiums for the best experience in gaming etc. Nobody pays a premium for an APU. Catering to poor people will never make you rich. As I've said many times before consoles are dying, and would never make them rich either (mobile is going to kill them, see GDC 2013/2014/2015 surveys). NV wisely listened to their bean counters, and surmised as Jen himself said, it would steal from their CORE product R&D. We see he was correct looking at AMD. When will AMD quit chasing things that can't make them a dime and start getting back to products that can at least have a chance at PREMIUM pricing? The last time they made consistent profits? They had a CPU king. They currently have the best opportunity in years if they'd just take advantage of Intel chasing gpu. You have Keller+Papermaster and are wasting them if not making a KING CPU. Beyond that though, SELL NOW before your tech is worthless and just bought for patent ip wars (chizow's pennies on the dollar comment) and no real product worth. While I agree things look dire for AMD, it ain't over til the fat lady sings. I'm old enough to remember when 3dfx was king and Nvidia (then written nVidia) was a 3rd rate GPU manufacturer. I had one of their first video cards in my work computer (which caused me no end of headaches because of the hardware bugs). No today it is not possible, unless you make constant huge investments in things that is not technologically limited only. nVidia grew as first VGA chip player (then GPUs) because the 3D market was relative new and could invest in many new technological solutions that could compete and beat its competitors. Strategic choices were important (like using 32bit pipelines instead of only 16bit like 3D FX did). Then all the others improvements that brought it to n.1 before all the others just died because of their own incapacity to stand up with nvidia progresses. Today you can repeat that. You cannot innovate in this market as you could at the time. Both CPU and GPU are mature markets. You can't really expect to surpass the competition with something extraordinary that it cannot do or do so bad to give you a winning position on the market. And many forget that creating HW is useless if you cannot support it as it should. AMD has the problem that can create the best HW ever, but if they cannot use it at it full, it is just useless. Think about the fact that AMD doesn't have a up to the competitive professional market. All those publicized DP and SP numbers that Hawaii/Tahiti can crunch, are simply wasted as they are not able to sell it to any HPC producer. Good for useless LuxRender benchmarks and nothing more. Not necessarily. The publicly redacted form of the cross license agreement is available on the SEC website and, yes, there is a clear provision that the license is not transferable in the event of change of ownership of the company. AMD is selling huge Tahiti chips for $200 or so. Income is definitely declining. The problem is AMD really doesn't have a solution for this near term. According to rumors the only GCN 1.3 GPU in AMD's upcoming lineup will be Fiji. The rest of the lineup will be refreshes of existing GCN 1.1 and 1.2 GPU's, with at most hardware revisions to improve efficiency. This means that we're still going to see something like Tonga at ~$200 price point, and something like Hawaii at ~$300-$400 price point, along with their expensive GPU's and memory interfaces relative to the competition. I think with the enhanced compression in Tonga, AMD are trying to reverse the trend of stupidly complex memory controllers, much like NVIDIA did. Can't speak for HBM, though. It's much easier to scale down large GPUs that scaling up small ones as far as I can see, so the GPUs within even lower end AMD cards are far more complex than they should be, hence some of the power drain (remember - the 5830 used more power than the 5850), though it does mean they get to reuse more failed parts.